Armasight® Discovery 8X Gen 2+ QS Night Vision Binoculars are professional quality night-vision... with a difference you can see in black and white! Skip the green screen adventures! The Armasight Discovery 8X Gen 2+ QS Night Vision Binocular features a high-performing gen 2+ Quicksilver white phosphor image intensifier that lets you see in black and white... that means more of the contrast your eyes and brain are used to seeing and improved detection in every situation! And Quicksilver technology comes in a Gen 2+ tube that packs an impressive 47-54 lp / mm resolution that rivals many gen 3 tubes but at a super value price. 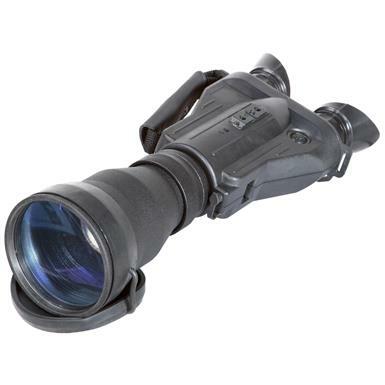 It's all built into a streamlined design that's perfect for extended reach nighttime observation, surveillance and perimeter security and packed with the features you need to get the job done: Smart magnification, automatic brightness control, bright light shut-off circuitry and a spot / flood built-in IR illuminator. Approx. 13 3/4 x 5 1/2 x 2 1/2", 3 1/2 lbs.